Another great co-production with Pixelheaven.tv for our LA office: the music video of Armin van Buuren and Lauren Evans! In this cooperation our LA office has hired and managed the film crew and cast, which was over 30 people. 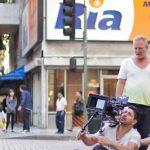 They have scouted all film locations, managed the permit process, secured all permits through the FilmLA office and developed the operational plan for filming a very complex shoot. 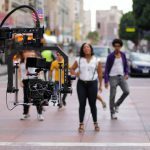 This music video was shot in two days in various locations in downtown Los Angeles. The most prominent is the intersection of Broadway & 8th street where they had a 22 foot crane and choreographed dance sequence, with traffic being managed by off duty police officers. Again one beautiful production with a great music video as result!